Got a load of plastic bottles taking up space in your recycling bin? Why not do what Maria Ponce did and use them to build a house? The 78-year-old from El Salvador in Central America could not afford to buy a normal home, so she built her own. It took around three months to create, but the end result is not only kind of beautiful (the bottles are painted green with white polka dots), it also meant that she and her 102-year-old companion finally had somewhere to live. She’s not the only lady to have had this clever brainwave – back in 1968, John Milkovisch built a home made out of 50,000 beer cans. 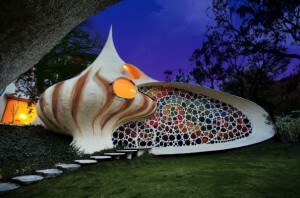 This gorgeous shell-shaped home with a stunning stained glass wall is the work of Javier Senosiain and was inspired by the works of Gaudi and Frank Lloyd. It was designed for a young family, who were bored of their conventional home and instead wanted a property that was better integrated with nature. The home looks like a giant shell both inside and out – there isn’t a non-curvy wall in sight! The way the light pours through the stained glass is glorious. It’s an odd home, but certainly a beautiful one. 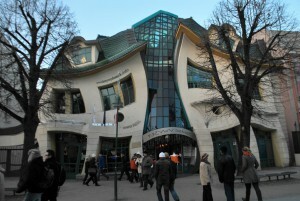 While it may look like something out of a Dr Seuss book, this quirky building was actually created as a homage to children’s book illustrator Jan Marcin Szancer. It was inspired by one of his drawings and is now a hugely popular tourist attraction. Unfortunately, it’s not actually a house – it’s a shopping centre, though that does mean you can venture inside. To be fair, if it was a house, it would have to have a very wacky interior, which you would probably get sick of pretty quickly! You’d be mistaken for thinking that this home is actually a crashed UFO – that’s exactly what it looks like! Built by Harold Bisner Jr. in 1970, this unique abode was designed to look like the information centre of a nuclear generator plant. It doesn’t sound homely, but it’s actually quite beautiful inside and out. It has several observation decks, so you can see the Mojave Desert from every possible angle. Inside, the home is open plan with wonderful vaulted ceilings, which makes it seem quite spacious. The décor is still a bit 1950, but we think that adds to its charm. Remember that children’s story about the old woman who lived in a shoe? Well, your mother wasn’t lying to you – there really is a woman who lives in a giant, 25-foot high shoe; albeit one made out of concrete. The home was built in 1948 by Colonel Mahlon N. Haines, who owned more than 40 shoe shops. It was originally created to be an advertising gimmick, but over the years it’s been a museum, ice cream parlour and now a home. The shoe currently belongs to Carleen Farabaugh and her husband. Their home is completely shoe-themed – it has shoe-shaped stained glass windows, wooden fences and even a dog house. You’d have to be pretty obsessed with footwear to own this home. Some of us would love to own the houses used for the external shots of our favourite films and TV shows, but many of the properties we fall in love with don’t actually exist in real life. One horror-mad couple found a way around that – they spent more than £225,000 creating a perfect replica of the mansion featured in their favourite TV show, The Munsters. What’s more, the mansion is a fully-functioning home, which the family live in all year round. Everything inside the house exactly matches what is seen on the show, right down to the furniture. Lucky visitors can see everything from the pet dinosaur living under the stairs, to Grandpa Munster’s dungeon. They really have gone all-out. There are tons more out there, but these are a few of the strangest homes we could find. Some are sure to fetch a pretty penny in the future, whereas others will no doubt struggle to be sold – they’re just a little too unique. Before you built yourself a weird home, give some thought as to what will happen to it in the future – you may not want to live there forever!